Gemma and Dan have a great relationship but it is put to the test when they make the very grown up decision to buy a house. To save money, they move in with Dan’s mum Belinda and it is then in the claustrophobic environment that the cracks begin to show. Along with the house being a massive money pit it also has awkward sellers and an estate agent who doesn’t seem to be on Gem and Dan’s side. To throw in further complications Gemma’s past catches up with her; thus making the already fraught situation seem worse. The Love Shack is a story of love. It may sound cheesy but real love. Love that is complicated by reality, the things in life that you can’t always control and I think that is why it is so good. Jane Costello has created characters that you genuinely care about and wish you were friends with so you could give them the advice that you are so intently shouting at the book, hoping that they hear what you have to say…but you know, them being fictional makes it a tad hard to do. Personally, there was another element of the book that I enjoyed greatly was the Liverpool setting. This probably won’t titillate everyone who reads it but being a girl who was born and raised (and who still resides) in Liverpool I loved that I was able to connect the dots and really visualise actual places and to see that Costello was true to their beauty (seriously, Liverpool has some fantastic architecture) throughout The Love Shack. I really enjoyed The Love Shack. It was a fun and to some extent easy read that did deal with some gritty issues. I think that shows Costello’s skill as a writer. As this is the first of her book that I have read I can safely say that it won’t be my last. One thing is for sure, I am now genuinely terrified about ever buying a house. 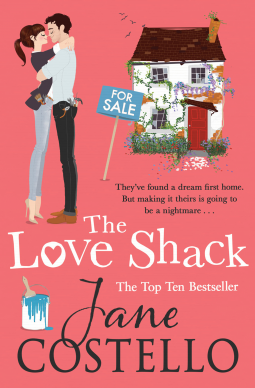 The Love Shack by Jane Costello is available now. Follow Jane Costello (@JaneCostello) on Twitter.